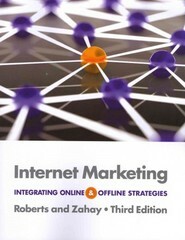 Internet Marketing 3 Edition INTERNET MARKETING, 3RD EDITION provides comprehensive coverage of the rapidly changing field of Internet marketing that is timely and relevant. It relies on extant marketing theory where appropriate and introduces many conceptual frameworks to structure student understanding of Internet marketing issues. Above all, it works on the premise that the Internet--whether used as a medium of communication or as a channel of distribution--is only one component of the contemporary marketer's arsenal. The key issue facing marketers today is how to best integrate this powerful new component, continuing developments in Internet marketing into their strategies and media plans. That ongoing challenge represents the essential theme of this text.